Gerry Byrne - The toughest of them all! - LFChistory - Stats galore for Liverpool FC! Gerry Byrne - The toughest of them all! "I've had many skilful men and the likes of Peter Thompson, Ian St John, Kevin Keegan and Steve Heighway were the ones who caught the eye. But the best professional of the lot was Gerry Byrne. He wasn't flashy and he wouldn't score you goals. But he was hard and skilful and gave you everything he had. More than that he was totally honest. Which is the greatest quality of all. He was a true Liverpudlian who couldn't look his fellow Scousers in the face after a game unless he'd given everything he had for 90 minutes." - Bill Shankly in 1975. I am reallly, really sad to hear of Gerry Byrne's death. I knew he had not been well for a while suffering with Alzheimer's. I only spent one afternoon with him... I interviewed him and then spent a few hours listening to great stories in the company of Byrne, Ian Callaghan and Jimmy Melia in the now defunct Living Room on Victoria Street. You sometimes had to drag the words out of him in the interview as Gerry always preferred to do his talking on the pitch and was quite silent off it. After the talk after a couple of white vines Gerry proceeded to imitate how Shankly combed the few strands of front hair in the mirror in the club dressing room. And he made me feel his historic collar bone.. it never properly healed after it broke in the 1965 FA Cup final. You could still feel where it broke. I got a great hug from him when we said goodbye. He will be sorely missed. Ian Callaghan set up the interview with Gerry who was in town from Wales, where he resides. Gerry was going to meet with Callaghan, but arrived half an hour earlier than Callaghan to talk to LFChistory.net about his legendary Liverpool career. Gerry wasn't very optimistic he would have a career in football as he had his difficulties when trying to break into league football. When I was a young boy I played for Liverpool Schoolboys and Liverpool Catholic boys. The guy who ran the Liverpool Schoolboys was Mr Williams and no matter what I did he didn't like me. I never got a game. I got trialled and he put me as an outside left and I scored three goals. I still didn't get into the team. I was fifteen then and was picked for the Liverpool Catholic Schoolboys who were playing in Dublin. I went over to Dublin where I got spotted by a guy called Tosh Moore, who always had a little cigarette [imitates Tosh, stands up, squinting his eyes and pretending he had a cigarette stub in his mouth] and he signed me on at Liverpool. I was two years as amateur and when I was 17 I signed professional. My first wages were 8 pounds and 12 pounds [laughs]. 8 pounds in the close season and 12 pounds in the season. 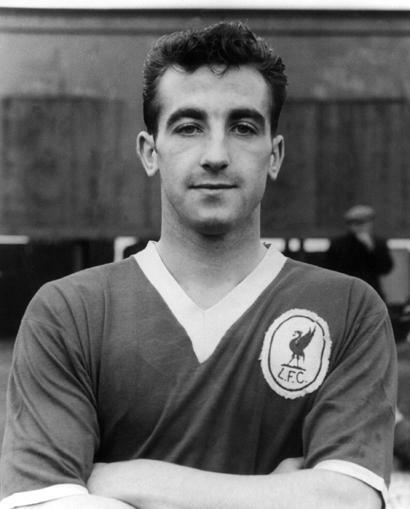 Gerry Byrne made his Liverpool debut vs. Charlton on the 28th September 1957 when he was nineteen. Liverpool got beaten 5-1 and it was a personal disaster for the young full-back as he scored an own goal. I wish the ground would swallow me up when you score a goal like that. I just passed it back to Tommy Lawrence and he wasn't there. I got terrible abuse from the crowd. Byrne didn't get a second chance until a year later, and then four months passed before he made his third appearance. I wasn't playing in the first team when Shankly arrived. I was on the transfer list, to be honest. When Shankly came everything changed. I got into the team at right-back. Ronnie Moran was at left-back and when he retired, or nearly retired I took his place. Chris [Lawler] came in then at right-back. In Byrne's fourth game for Shankly's Liverpool on 18th April 1960 vs. Rotherham it was clear he had made an impression on the sportswriter for the News Chronicle and Daily Dispatch along with his close mate, Callaghan: The headline read: Liverpool new boys star turns. "Four points out of four, seven goals for, not a goal against, is sufficient to satisfy any club during Easter, yet the most satisfying feature of this one-sided game was the proof that manager Bill Shankly has made two master moves. Local boy Gerry Byrne, at right back, again proved himself as a scientific defender of the Cresswell type, and latest sensation Ian Callaghan, 17-year-old, has solved the outside-right problem." You were quiet off the field, but it was a different story on the field. You were a menacing player. Oh, yes, I cut my hair short, trying to look tough. Even though he had little to say he wouldn’t be pushed around on the field. From Tommy Smith's interview on shankly.com: "I was only fifteen and playing in a five-a-side game at Melwood. I nutmegged Byrne and scored and I was on top of the world. A couple of minutes later a ball dropped between us, I went to head it and Gerry headed me and I went down with a gashed eye. As I lay on the ground covered in blood, Shankly strolled across, looked down at me and said 'Lesson number one, never nutmeg Gerry Byrne son and think you can get away with it'." I got Smithy back. Shankly said to him: 'Don't nutmeg Gerry Byrne.' Bobby Charlton used to have a black book where he put their names down who he was going to get later. I was nicknamed the "Crunch". I was a clean player. I was hard, but fair. I used to wait for the ball to come and then I was on my way. You hit someone when the ball was there and that was it. That's how I got the crunch. I didn't go after players intentionally. I was never sent off in my life. You were described by Bob Paisley as: "He was a bit of a loner, similar to Kenny Dalglish, in that way. He never got among the lads and was the quiet one in that cup-winning side. But he never shirked anything and was tough as they come, as he proved at Wembley." I was quiet, I never spoke up very often. Do you see yourself in some player today? They can't tackle. They give a foul, don't they? There are more foreign players than homegrown players at the moment. Where are the home-grown players? There is only like Jamie Carragher and Steven Gerrard.